What LinkedIn Triggers and Actions are Supported? Create Company Update - Creates a new update for a Company Page. Create Share Update - Posts a status update sharing some content. Next, you'll be given the option to label or otherwise name your Account. Don't worry about what you call it, it won't change which account gets connected. It just helps you identify your accounts just in case you have more than one to connect. Click continue! 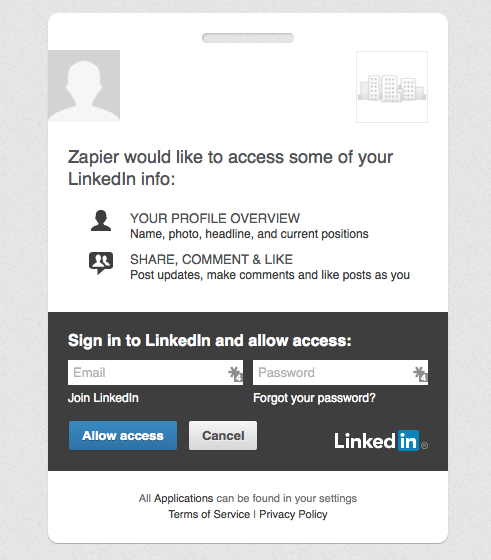 If you aren't already logged in to LinkedIn you'll need to log in first and confirm the connection to Zapier. Just click Allow Access to continue. Now you should be back at Zapier and we should test your Account for you. If everything checks out, just keep going! LinkedIn only allows accounts to be valid for 60 days at a time. In order to reconnect, you must walk through the approval process again every 60 days. You can quickly reconnect here. LinkedIn publishes daily usage limits for each trigger and action on Zapier. You can find the limits here. Linkedin have removed some Triggers and Actions from their public API which means you will no longer be able to use them. We've posted an update blog with more info about this here.